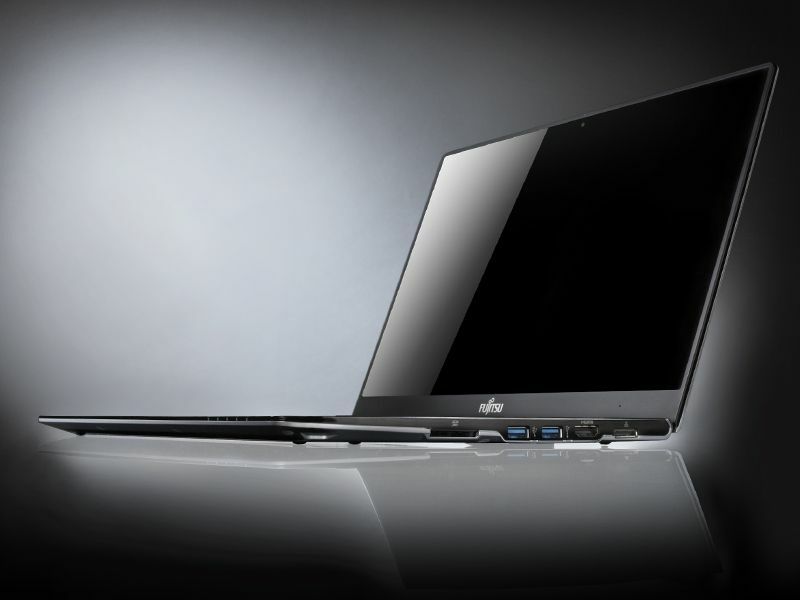 Fujitsu may have launched the SH771 high-end ultra-light but that doesn’t mean they aren’t going to produce an Ultrabook. How do we know? 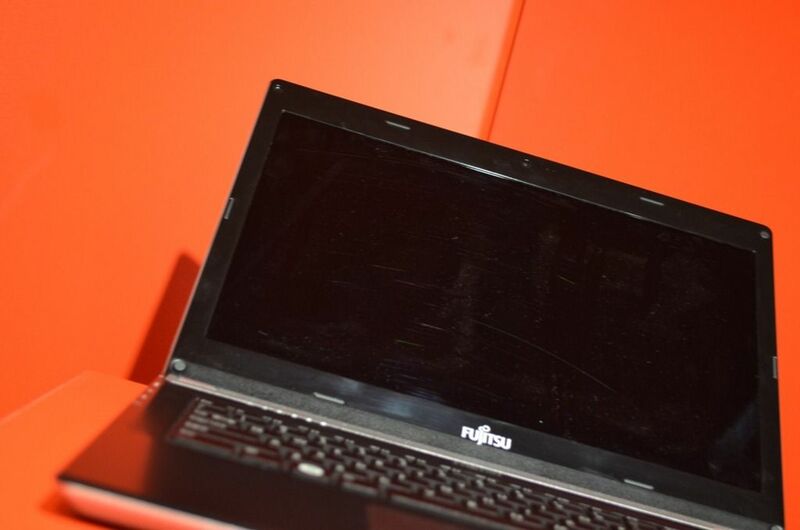 We have pics of Fujitsu Ultrabooks! 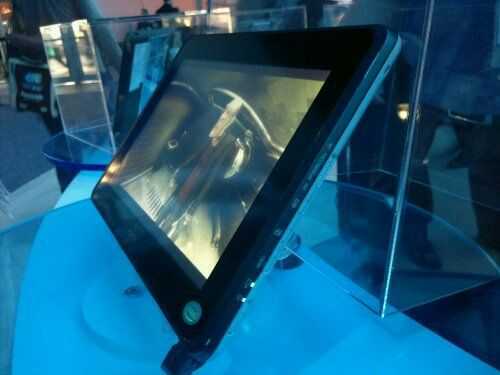 Sent to us from Mr Blurrycam himself and marked-up with equally fuzzy information, these pics are supposed to have been shown in a private event recently and were highlighted as Ultrabooks for the 2012 market. There’s two models being shown here. One is an almost ready 13”er, the other, just a plastic prototype of an 11” Ultrabook which leads us to believe that we’re looking at a Sandy Bridge model and a slightly thinner Ivy Bridge device here. It’s time to fire another warning shot across the bows of the over-eager marketing teams. Here’s the truth about the battery life on the ‘18 hour’ Fujitsu SH771. 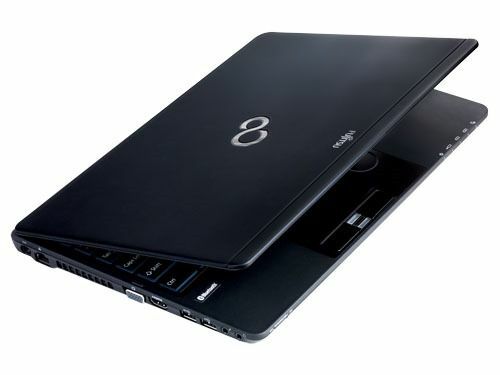 But first, let us pay respect to the fact that there is a class of devices above Ultrabooks that can retain features like DVD, fully-clocked CPUs, large battery capacity options and still keep the weight down. The Fujitsu SH771 looks like it offers the best of both worlds. In some respects it does, but it starts at $1800. Press release here. Battery life analysis below. You’ve probably seen plenty of previews of Windows 8 over the last 12 hours or so given that its just gone publicly available as a preview. 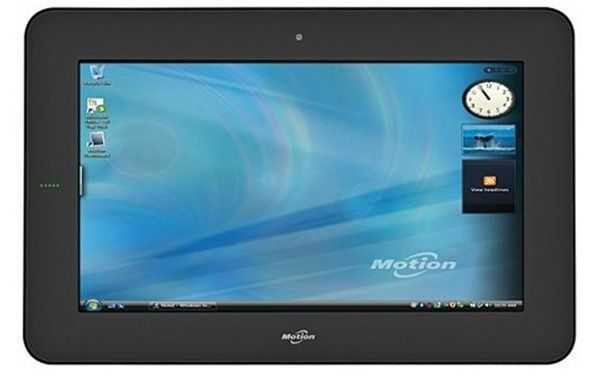 The operating system offers multiple usage scenarios for touch, mobile and productivity. 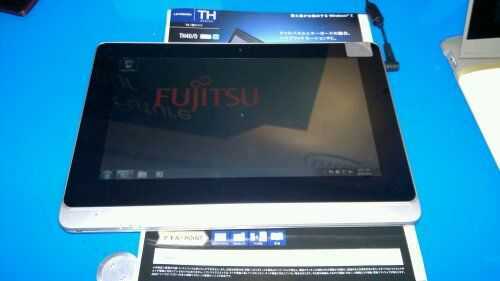 Devices like the Fujitsu TH40 will benefit highly from Windows 8 as they too offer multiple usage scenarios. 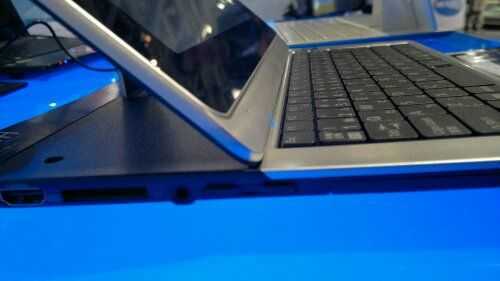 I was really quite impressed with the device after my hands on at the Intel Atom Showcase here at IDF. Of all the Oaktrail devices I’ve tried, this has been the best experience yet. I was left wondering why this is only available in Japan. Look out for the optical mouse pointer. Given my experience with other Oaktrail devices I would put the working battery life, screen on, at about 4-5hrs. Two points I would have to think carefully about are the longevity of the slider mechanism and the processing power which, on Oaktrail, is never really going to impress anyone. A few days ago I found a CPU-Mark score for the ‘Oaktrail’ Z670 CPU. It confirms to us in no uncertain terms that the 1.5Ghz single core Atom CPU is, relative to other X86 CPUs, extremely weak and really no different from the first generation Atom CPUs that came before it. The difference with Oaktrail is that the memory and graphics speeds should be vastly superior to that which we saw on the ‘UMPC’ platform, Menlow, over the last few years. Coupled with quality components and good engineering it should be able to provide an acceptable Windows tablet experience and offer some interesting battery life scenarios too. In theory. In practice we’re going to have to wait for more Oaktrail Windows tablet hands-on and it looks like the wait for the first Oaktrail based devices has finally come to an end. In Germany the Fujitsu Stylistic Q550 is now shipping and, even better, the guys at Gottabemobile have got both the Fujitsu Q550 and Motion Computing CL900 in their hands. 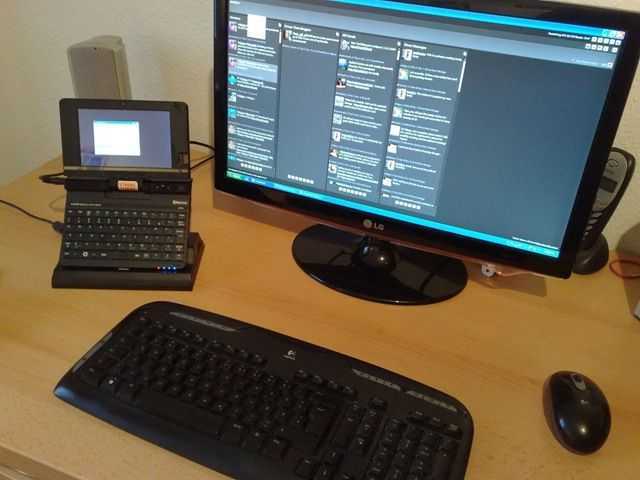 Sumocat (@sumocats) has the Q550 and Chris Lucksted (@DangerousWit) has the CL900. a 43 WHr battery providing up to 8 hours of runtime with a 4:1 work/charge ratio allowing the CL900 to charge from zero to full in two hours. I’m not sure if that’s the marketing talking there or the real world testing. An average 5W drain would be something to talk about. Flipping back to the Q550 review you’ll see some discussion of that in the comments. Sure enough, with the screen brightness turned low, but still usable, there was an indicated 8hrs battery life on the Q550. This is with the 4-cell, 38Wh battery which means Oaktrail is indeed running in a very low power envelope. It’s the power-envelope that’s the key here. 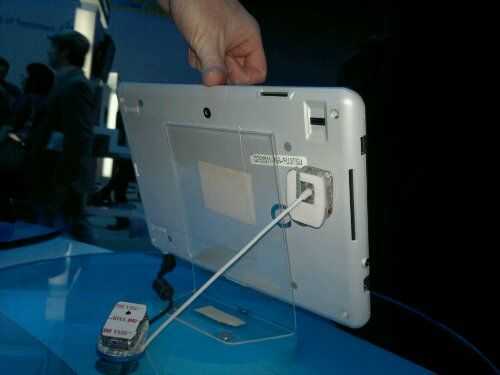 It’s allowed the 10 inch Windows tablet design to drop the fans and shrink to under 2lb (about 800gm.) The question is, is it fast enough? The trade-off could be too much for some, especially as we’re talking about pro-mobile users here. The Q550 customers aren’t exactly casual internet users. I’ll be interested to see some SSD speed tests and GPU tests done on the Oaktrail platform and to do some more tests on the SSD (which could, in theory, be struggling and blocking if it’s not good enough.) We’ll also have to wait for more tests. The CL900 part 2 review is expected today. 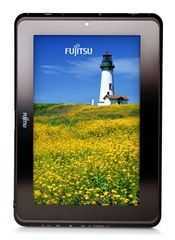 Fujitsu Q550 Oaktrail Tablet Now Available to Order. ‘Shipping June 2011’ says the Fujitsu store in the U.S. which means that the Fujitsu Stylistic Q550 (and mass production of Oaktrail) is getting nearer. 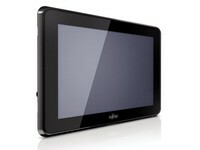 The Q550 is a pro-targeted tablet with some interesting features that I reported on back at CeBIT. A 400-nit screen IPS screen, 2GB RAM, remote security, capacitive/digitiser input, fast-charge, removable battery options, 4 USB ports, Gobi 3G option, SSD, docking port and an array mic are just some of the advanced features you’ll find which indicated a pro-level, industry focused solution. It also gives you clues to the price. I’m pleased to say that my price prediction of $1000 entry-level was too high. The entry-level Q550 comes in at $730. For that you’re getting the 30GB SATA SSD, Windows 7 Pro, IPS high brightness capacitive touch display with digital pen input and 2GB of RAM. You only get the 19Wh battery ‘quick swap’ battery pack though but for $120 more, you can get the 38Wh battery with a 62GB SSD. That’s a good option. Don’t forget that there’s the fingerprint sensor, HD video decoder (GMA600), front and rear cams, Bluetooth 3.0 (no H.S. 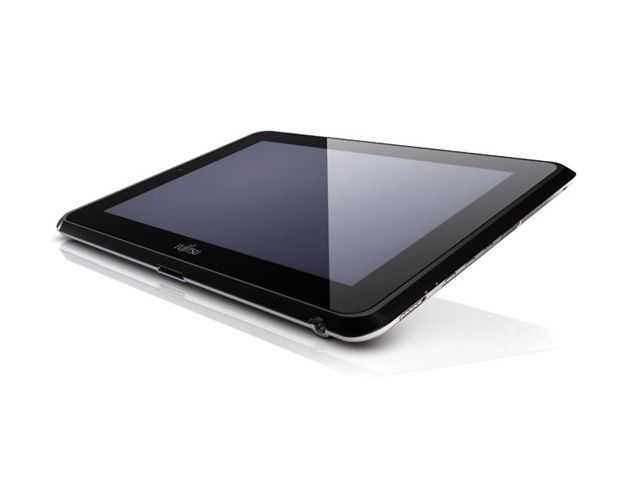 specified) magnesium alloy back cover, strengthened glass. The weight, with the small battery, is only 1.7lbs / 770 grams. A docking cradle is available but after reading the specs, it looks like it’s a USB/Power unit only. Full specs and a new set of images available through the Q550 information page. 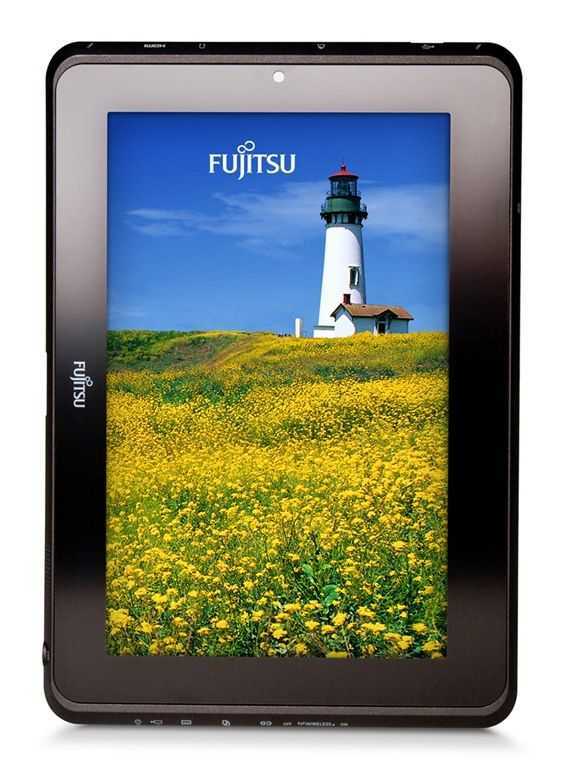 For Fujitsu, $729 is quite aggressive but there’s one unknown that affects all Oaktrail tablets at this stage â€“ battery life. My estimate is ‘up to 4 hours’ on the 19Wh battery which means 2-3hrs in use. With the extended battery pack, it would have a useful 6hrs usage time for under 1KG though. One final thought, MeeGo and Android are being built for Oaktrail. This could be an interesting product to hack around with later in 2011. CeBIT is a very traditional, business-like show. Suits dominate and after-show parties are few and far between. Companies like Microsoft often present purely business-focused products and strategies and if you’re expecting another huge pile of consumer tablets, you’re probably going to be disappointed. 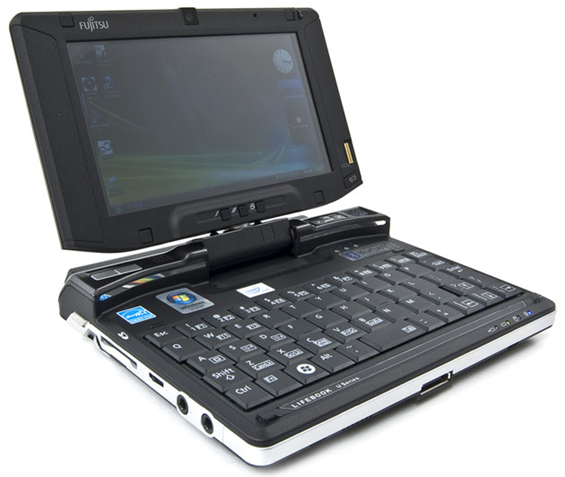 For readers of UMPCPortal, our pro-level site (that has, I admit, been pretty dry on news lately) it’s good news because products like the Fujitsu Stylistic Q550 get a chance to shine. 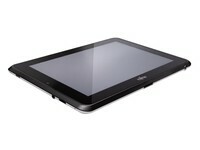 We’ve got the full, official specs in the database now and wow, this is not your average tablet PC. The price isn’t available right now but the Q550 has already launched in Japan with a availability stated as March/April. A CeBIT launch is also planned and we hope to get a pricing indicator next week. A guess around the 1000 Euro mark for entry-level configuration is probably not far off. Note that there’s a lot of talk about 8 hours battery life but a Fujitsu sales site in Japan makes it clear that this is with the extended battery (38wh) in a JEITA (largely idle) test. Take 30% off that for real world figures. With the standard battery, a 19wh unit, you’re looking at 3.5hrs max. That isn’t going to impress many but at under 900gm for a 10 inch PC, it’s good. We hope to get some good testing time in with the Q550 and bring you information on graphics, SSD speed and more battery life thoughts. Capacative touchscreen. Oaktrail, Windows 7, 2GB, fingerprint readera and looking like it’s aimed more toward prosumer and business/vertical markets. No product name at the moment. Should be coming to market in 1-2 months. The Secret Life of a Desktop UMPC. It’s been about 2-weeks since I last used my daily desktop PC and 2-weeks since I’ve heard that horrible background noise of fan and disk. For the last two weeks I’ve been using a silent, modular, ‘grab and go’ solution based on the Fujitsu U820 ultra mobile PC and it’s working out very well indeed. You won’t find many solutions like this out there because this is one of the secrets of the ultra mobile PC world that marketing teams and board members get scared about â€“ a multi-scenario device! It’s a good day when Woot throws up a ultra mobile PC for sale, and today is one of those days. I think this is a first for Woot â€“ they are offering the Fujitsu U810 [Portal page] at sellout.woot.com today for $399. This seems to be a pretty good deal as a quickly glance around the web reveals that you can’t even get a used U810 this cheap, let alone a brand new one. Though the U810 is quite dated, it might make for a good experimental mobile computer if that’s your thing. 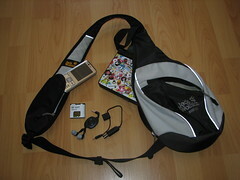 Brief specs following; see the above linked Portal page for additional details. Remember, as per Woot’s tradition, this deal will be gone after today, and could potentially sell out even before then. As the Smart Q7 doesn’t look like its going to turn up today, (expected tomorrow) I thought i’d relocate for a few hours. 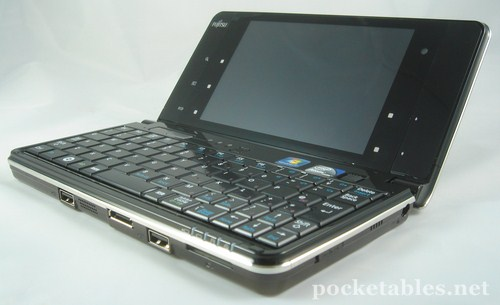 I’ve taken the Fujitsu Loox on a little tour and right now I’m sitting in the park.. More details in my scrapbook website. Gone Mobile Bloggingâ€¦ Watch and Communicate | Chippy’s HiBlue Lab.